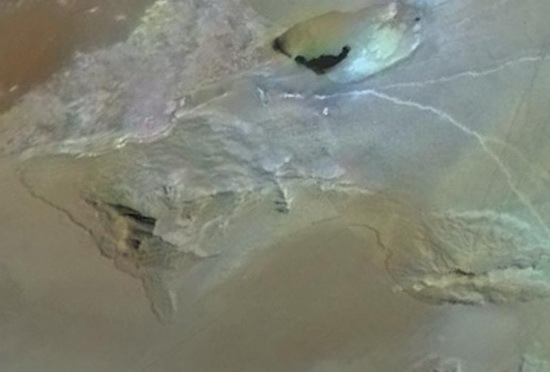 Arsia Mons is 270 miles (approximately 435 kilometres) in diameter, almost 12 miles high (more than 9 kilometers (5.6 mi) higher than the surrounding plains), and the summit caldera is 72 miles (approximately 110 km) wide. It experiences atmospheric pressure lower than 107 pascals at the summit. Except for Olympus Mons, it is the biggest volcano in volume. Arsia Mons has 30 times the volume of Mauna Loa in Hawaii, the largest volcano on the Earth. Mauna Kea (Hawaii) has an altitude of 4,205 meters (2,6 mi) - much lower than Mount Everest. 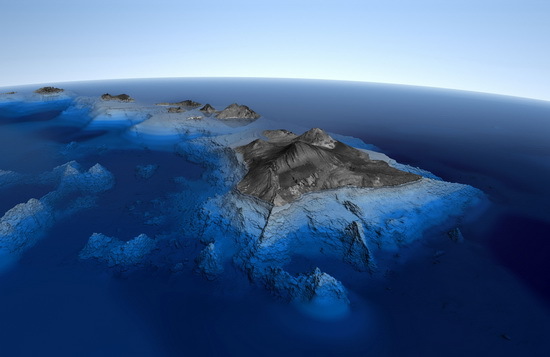 However, Mauna Kea is an island and if the distance from the bottom of the nearby ocean floor to the peak of the island is measured, then Mauna Kea is taller than Mount Everest. Mauna Kea is over 10 km (6,2 mi) tall compared to 8.848 m (5,5 mi) for Mount Everest - making it the Earth's tallest mountain. 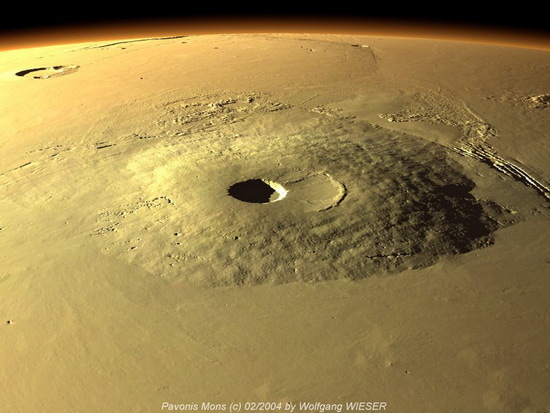 Pavonis Mons is a large shield volcano located in the Tharsis region of the planet Mars. Pavonis Mons is the smallest of the Tharsis Montes volcanoes, measuring about 375 km across and standing 14 km (8,7 mi) above Mars' mean surface level, but height from base to peak is about 11 km (6,8 mi). As a shield volcano, Pavonis Mons has an extremely low profile with flank slopes that average only 4°. The summit contains a deep, circular caldera that is 47 km in diameter and almost 5 km deep. A larger, shallower depression lies immediately northeast of the smaller caldera. The large depression is about 90 km in diameter and structurally more complex than the small caldera. Elysium Mons is a volcano on Mars located in the Elysium Planitia, at 24.8°N 146.9°E, in the Martian eastern hemisphere. It stands about 13.9 km (7,8 mi) above the surrounding lava plains, and about 16 km (9,9 mi) above the Martian datum (mean surface level). Its diameter is about 240 km, with a summit caldera about 14 km across. It is flanked by the smaller volcanoes Hecates Tholus to the north, and Albor Tholus to the south. Elysium Mons was discovered in 1972 in images returned by the Mariner 9 orbiter. 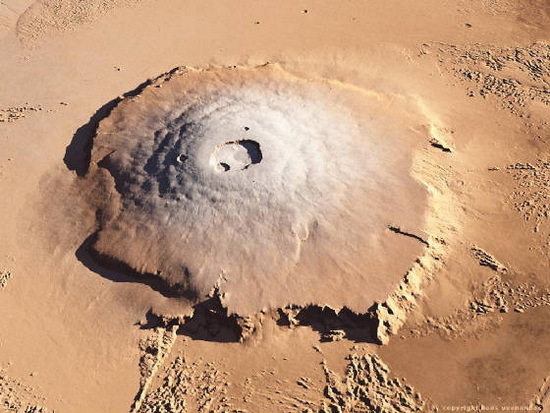 The Emi Koussi volcano on Earth has been used as an analog for Elysium Mons. 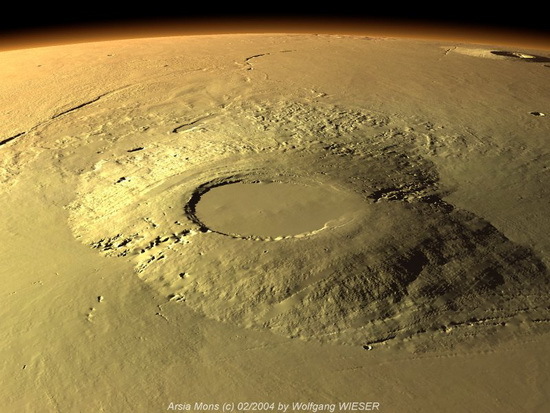 Ascraeus Mons is the second highest mountain on Mars. Mountain is roughly 480 km in diameter and is the second highest mountain on Mars, with a summit elevation of 18.1 km. It is surrounded by lava flow plains that are mid to late Amazonian in age. The elevation of the plains averages about 3 km above datum (Martian "sea" level), giving the volcano an average vertical relief of 15 km. The volcano has a very low profile with an average flank slope of 7°. Slopes are steepest in the middle portion of the flanks, flattening out toward the base and near the top where a broad summit plateau and caldera (collapse crater) complex are located. 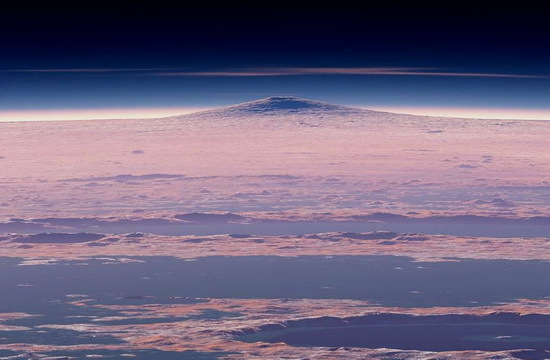 Boösaule Montes is known to be the tallest non-volcanic mountain of the Solar System. It is located at IO, the fourth largest satellite of the Solar System and innermost satellite of the planet Jupiter. The geology of IO is quite interesting as it contains about 400 active volcanoes and contains over 150 mountains on its surface. The Boösaule Montes is one such mountain that lies on the northwest of the large Pele plume deposit and reaches an elevation of 17 km (10,6 mi). The mountain got its name from a cave in the Greek Mythology where Epaphus, son of Zeus, was born. 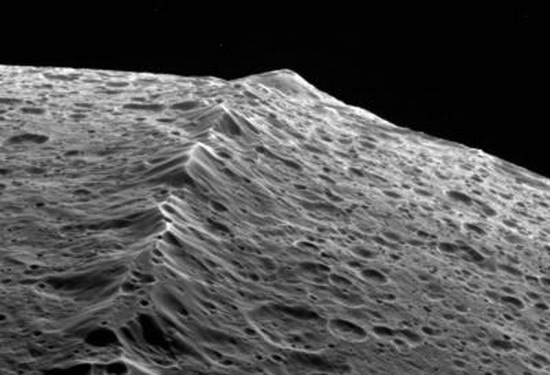 Located on the dark hemisphere of the third largest satellite, Iapetus, of the planet Saturn, the Equatorial Ridge runs along the center of the hemisphere with some isolated peaks as high as 20 km (12,4 mi). The Equatorial Ridge was discovered by Cassini spacecraft on December 31, 2004. The formation of the ridge is still debated upon; however, it is agreed that the ridge is ancient as it is heavily cratered. The prominent bulge of the ridge gives Iapetus a walnut like shape. 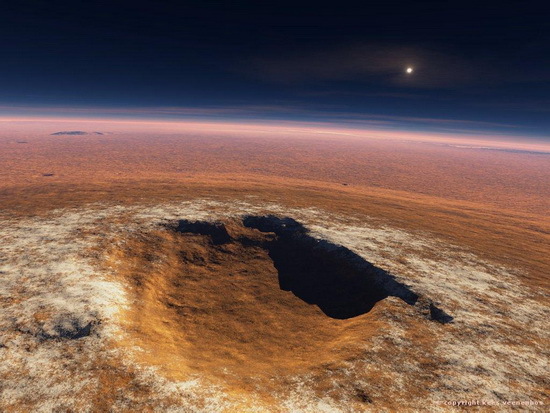 Olympus Mons is a large volcanic mountain on the planet Mars. At a height above the surrounding plains of almost 22 km (13,7 mi), it is one of the tallest mountains in the Solar System and over twice as tall as Mount Everest, the tallest mountain on Earth. Olympus Mons' elevation above the mean surface level (Martian datum) is over 25 km (15,5 mi), which males it the highest mountain in Solar System on that measure scale. This mountain is the youngest of the large volcanoes on Mars, having formed during Mars' Amazonian Period. Olympus Mons had been known to astronomers since the late 19th century as the albedo feature Nix Olympica. Its mountainous nature was suspected well before space probes confirmed its identity as a mountain. Vesta is the second most massive asteroid in orbit around the Sun. Rheasilvia is the most prominent surface feature on asteroid 4 Vesta. 460 kilometres (290 mi) in diameter, it is 80% the size of the asteroid, making it one of the larger craters in the Solar System, and covers most of the southern hemisphere. It is believed to be an impact crater. It was discovered in Hubble images in 1997, but was not named until the arrival of the Dawn spacecraft in 2011. It is named after Rhea Silvia, a mythological mother of the founders of Rome. Rheasilvia has an escarpment along part of its perimeter which rises 4–12 km above the surrounding terrain. The crater floor lies about 13 kilometres (8.1 mi) below the surrounding surface. This basin consists of undulating terrain and a central mound, almost 200 kilometres (120 mi) in diameter, which rises 23 kilometres (14,2 mi) from its base, one of the tallest mountains in the Solar System (highest by base-to-top measurement). Spectroscopic analyses of Hubble images have shown that this crater has penetrated deep through several distinct layers of the crust, and possibly into the mantle.